HomeThe HypeDo you hear the people sing at the Bord Gáis Energy Theatre? Do you hear the people sing at the Bord Gáis Energy Theatre? 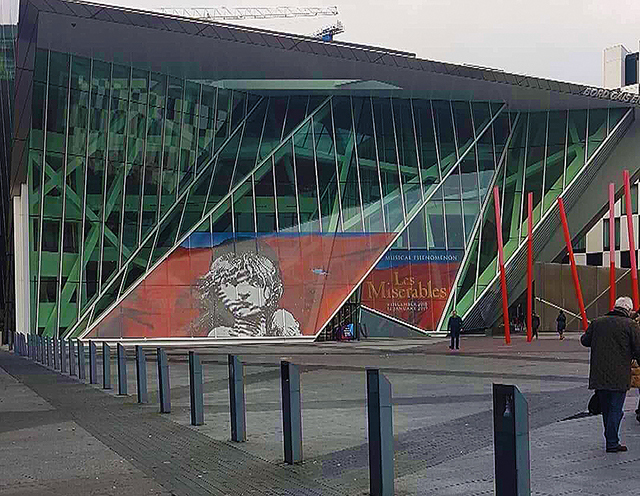 At this point every theatre fanatic knows Les Miserables like the back of their hand, but the production at the Bord Gais Energy Theatre took the show to new heights. Set at the end of the French revolution, Claude-Michel Schönberg’s renowned musical tells the story of one man’s journey to self-redemption after 19 years of imprisonment and another man’s decline to self-destruction. Jean Val-Jean (Killian Donnelly), who is on parole after stealing bread, promises to take Fantine’s (Katie Hall) daughter under his wing while running from Javert (Nic Greenshields), all while aiding in the many traumatic battles of the French revolution. Although it was not the classic set, lacking the revolving turnstile, it was made up in performances. The musical numbers in the show were spectacular despite the minimal change in stage design. The second the curtains were pulled; the audience knew they were in for a treat. Donnelly’s Val-Jean was nothing less than tremendous giving us a new dimension to the character. The passion and energy in his performance is hard to match for such a young performer. Greenshields’ Javert was just another performance that blew us away, the touching moments of songs like Javert’s Suicide and Stars were performances that gave the Oscar nominated film a run for its money. The classic love triangle between Éponine (Tegan Bannister), Marius (Harry Apps) and Cossette (Bronwen Hanson) was stunningly portrayed, with Cosette having an unusual sharpness to her character that made this connection to Marius more vibrant and alerting. Katie Hall gave us a performance to die for, one that left the audience on the verge of tears and earned her a well-deserved standing ovation at the end. The vulnerability brought to the character was exactly what is expected from Fantine but hard to access as a theatre actor. Thenardier and Madame Thenardier are always fun in this show, they constantly bring laughter and comic relief to this heavy-hearted musical. Martin Ball and Sophie Louise Dann gave a hilarious and witty performance that left the audience with a sense of joy in a dark musical. The Confrontation was one of the most powerful moments in this Tony award winning musical, as it proved that these actors have immense skills sets and are truly talented in this line of work. However, there were issues generally. The show itself is one not to miss a second of, so it was disappointing when the heating was on full blast and people were coming and going due to overheating. The staff did deal with this in the best way they could, moving audience members to seats with better air conditioning or closer to the door. Some even got moved to the box at the front. This performance made it feel as if you were watching it for the first time all over again, like they were brand new songs and a story so original and unheard before. Something new was brought to the fore, a classic transformed into a new definition of the word. There was not a dry eye in the theatre, from start to finish we were reminded why this show is a fan favourite, and why these are such treasured characters. There is not a bad word to be said about this show, from performances to costumes and set, this production of such a beloved piece of work was truly astonishing, one of the greatest shows to have graced that stage in recent times.